Many Indian lakes and rivers are polluted, and drinking from them is a health hazard. For this reason, more and more people in India are pumping ever-greater quantities of water—assumed to be clean groundwater – from underground wells. But in many places, this is also contaminated – with fluoride. Excess quantities of fluoride present a threat to health and lead to growth disorders, damage to teeth and bone deformation in those affected. Most of the fluoride collects underground as a result of natural weathering and ends up in the groundwater. The World Health Organisation WHO regards a concentration of more than 1.5 milligrams per litre as the threshold level. Eawag researchers working with the geophysicist Joel Podgorski, in collaboration with Indian experts, have shown that in India around 120 million people live in areas in which the groundwater exceeds this limit. The study appeared this week in the professional journal Environmental Science and Technology. It was financed partly by the Swiss Agency for Development and Cooperation SDC. In order to determine the extent of fluoride-contaminated groundwater, the researchers developed a computer model based on 13,000 fluoride measurements. The data was collected all over the country by employees of the Indian Central Ground Water Board between 2013 and 2015. Additional information about the geology, topography, temperature and precipitation values also fed into the model. 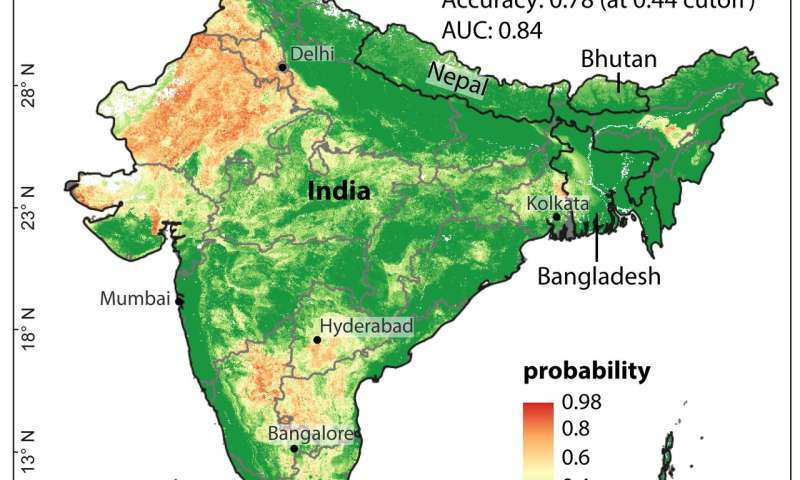 A geostatistical prediction model was thereby created that shows the locations on the Asian subcontinent where there is a high risk of the threshold concentration of fluoride in groundwater being exceeded. According to this model, there are many areas in the western and southern parts of the country in particular that are thought likely to contain fluoride-contaminated water. Combining this result with current population counts, the researchers calculated that nearly one in ten people in India could be affected by excessive fluoride concentrations. Geophysicist Podgorski stresses that the map cannot be used directly to determine which wells are safe and which unsafe; the resolution is not high enough. But the hazard map allows local officials to carry out specific analyses in high-risk areas. Not only fluoride, but geologically enriched arsenic, also is a significant problem in India's groundwater. The researchers working with Podgorski are therefore planning to compile a hazard map for this substance as well. "A hazard map doesn't help anyone, of course, but it provides the authorities with an extremely good basis for targeted investigations and the development of future water strategies," says Podgorski.